ATLAS collaboration has released a set of comprehensive results that illuminate the properties of the Higgs boson with improved precision, using its decay into two photons with LHC collisions recorded at a centre-of-mass energy of 13 TeV. Studies of this decay played a crucial role in the discovery of the Higgs boson in 2012 owing to the excellent mass resolution and well-modelled backgrounds of this channel. Now, by analysing more than 36,000 trillion collisions recorded in 2015 and 2016, the properties of the Higgs boson have been probed more precisely than ever. One major result of the new study is the measurement of the signal strength (μ), defined as the ratio of the number of observed and expected Higgs boson events. The closer the value of μ is to one, the more consistent is the observation to the Standard Model. The signal strength in the two-photon channel is measured to be 0.99 ±0.15 – in agreement with the Standard Model expectation. The precision has been improved by a factor of two, with respect to the previous measurements at energies at 7 and 8 TeV. The precision of signal-strength measurements of individual Higgs boson production modes are also improved significantly thanks to a better understanding of the ATLAS detector, the increased rate of Higgs production at 13 TeV and the extended use of machine-learning techniques to identify specific production processes. By analysing more than 36,000 trillion collisions recorded in 2015 and 2016, the properties of the Higgs boson have been probed more precisely than ever. At the LHC, the Higgs boson is produced through different channels with very different rates, including gluon fusion, vector-boson fusion, and associated with a W boson, Z boson, top-quark pair or bottom-quark pair. 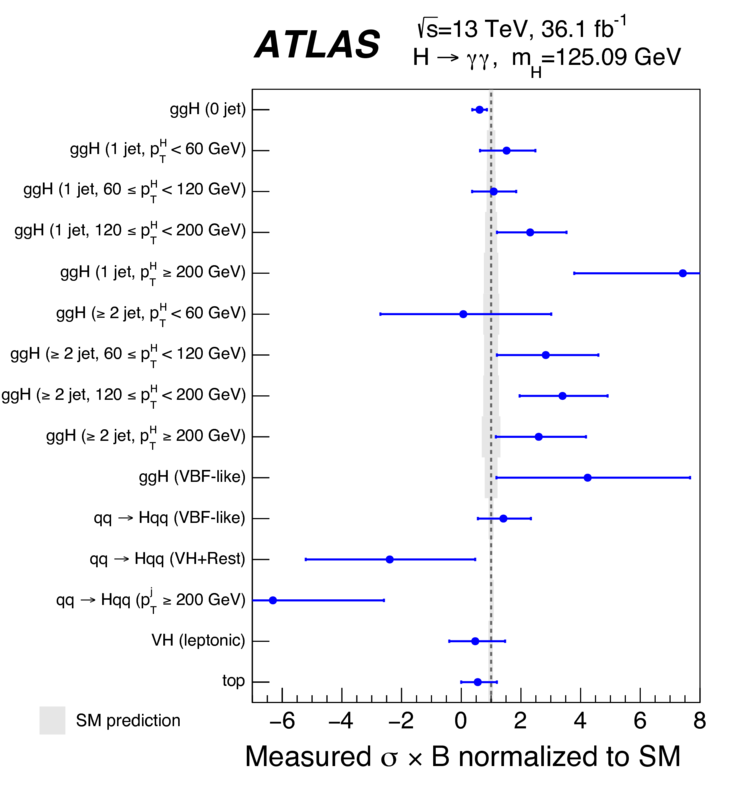 The new ATLAS results probe these production modes by measuring nine simplified template cross sections (STXS), which refer to the cross sections of specific Higgs production channels measured in different kinematic regions. Measurements of STXS are corrected for the impact of the Higgs boson decay and incorporate the acceptance of the experiment, so that they can be combined across Higgs boson channels and experiments (see Figure 1). The two-photon decay channel was also used to measure several differential cross sections for observables sensitive to Higgs boson production and decay, where good agreement was found between the data and Standard Model predictions (see Figure 2). Collectively, this new set of results at the highest LHC energies sheds light on the fundamental properties of the Higgs boson and extends our knowledge obtained from the first running period of the LHC. Read the original version of this text in the April 2018 edition of the CERN Courier. Measurements of Higgs boson properties in the diphoton decay channel with 36 fb−1 of proton-proton collision data at 13 TeV with the ATLAS detector (arXiv: 1802.04146, see figures).